Typically, the human ovaries produce a single dominant follicle that results in a single ovulation each menstrual cycle (Fig. 1). In any given cycle, the dominant follicle must complete all the steps in folliculogenesis in a timely manner. In this capacity, it survives the negative events that operate to destroy the other follicles by atresia. Recognition that only a few follicles become dominant beautifully demonstrates the fundamental principle that folliculogenesis in mammals is a highly selective process. This chapter considers what is known about the process underlying the expression of the structural and functional organization of developing follicles and how they are controlled. Folliculogenesis is the process in which a recruited primordial follicle grows and develops into a specialized graafian follicle with the potential to either ovulate its egg into the oviduct at mid-cycle to be fertilized or to die by atresia. In women, the process is long, requiring almost 1 year for a primordial follicle to grow and develop to the ovulatory stage. During the course of folliculogenesis, growth is achieved by cell proliferation and formation of follicular fluid, whereas development involves cytodifferentiation of all the cells and tissues in the follicle. Only a few follicles in the human ovary survive to complete the cytodifferentiation process, with 99.9% dying by a programmed cell death mechanism called apoptosis. The mechanisms regulating follicle growth and development are under the control of changing concentrations of ligands (i.e. hormones and growth factors). At the endocrine level, folliculogenesis is regulated by a central nervous system, anterior pituitary, and ovary cascade mechanism. Specialized hypothalamic neurons secrete pulses of gonadotropin-releasing hormone (GnRH) into the portal blood vessels, which acts on the gonadotrophs to cause a pulsatile release of follicle-stimulating hormone (FSH) and luteinizing hormone (LH), which act on ovarian follicle cells to control folliculogenesis. Although GnRH, FSH, and LH are critically important in regulating folliculogenesis, hormones and growth factors, which are themselves products of the follicle, can act locally to modulate (amplify or attenuate) FSH and LH action. This is the autocrine/paracrine system of developing follicles. It is believed that this local regulatory system plays an important role in the complex mechanisms governing the timing of folliculogenesis and whether a follicle becomes dominant or atretic. The steps and timing of human folliculogenesis are shown in Fig. 2. In women, folliculogenesis is a long process.1,2,3 In each menstrual cycle, the dominant follicle that ovulates its egg originates from a primordial follicle that was recruited to initiate growth almost 1 year earlier (Fig. 2). In a broad sense, there are two types of follicles (Fig. 2): preantral (primordial, primary, secondary [class 1], tertiary [class 2]) and antral (graafian, small [class 3, 4, 5], medium [class 6], large [class 7], preovulatory [class 8]). The development of preantral and antral follicles is gonadotropin independent and gonadotropin dependent, respectively. The rate of preantral follicle development is slow, requiring about 300 days for a recruited primordial follicle to complete the whole preantral period (Fig. 2). A long doubling time (about 10 days) for the granulosa cells is responsible for the slow growth rate. After antrum formation in the class 3 follicle (about 0.4 mm in diameter), the rate of growth accelerates (Fig. 2). The time interval between antrum formation and the development of a 20-mm preovulatory follicle is about 50 days (Fig. 2). The dominant follicle appears to be selected from a cohort of class 5 follicles at the end of the luteal phase of the menstrual cycle.1,2,3,4 About 15 to 20 days are required for a dominant follicle to grow and develop to the preovulatory stage (Fig. 2). Atresia can occur in all follicles (preantral and antral) after the class 1 or secondary follicle stage; however, the highest incidence is seen in the antral follicles that are more than 2 mm in diameter (i.e. class 5, 6, and 7) (Fig. 2). Folliculogenesis occurs within the cortex of the ovary (Fig. 3). The follicles in the cortex are present in a wide range of sizes representing various stages of folliculogenesis. The goal of folliculogenesis is to produce a single dominant follicle from a pool of growing follicles. There are four major regulatory events involved in this process: recruitment, preantral follicle development, selection, and atresia. All primordial follicles are composed of a small primary oocyte (about 25 μm in diameter) arrested in the diplotene (or dictyate) stage of meiosis, a single layer of flattened (squamous) granulosa cells, and a basal lamina (Fig. 4). The mean diameter of the human primordial follicle is 29 μm.5 By virtue of the basal lamina, the granulosa and oocyte exist within a microenvironment in which direct contact with other cells does not occur. The primordial follicles do not have an independent blood supply.6 It follows that primordial follicles have limited access to the endocrine system. The first visible sign (Fig. 7) that a primordial follicle is being recruited is that some granulosa cells begin to change from a squamous to a cuboidal shape.5 The first cuboidal cell is seen when the primordial follicle contains 8 granulosa cells, and the process is complete when the granulosa number reaches 19 (Fig. 8). The shape change is followed by the onset, albeit slow, of DNA synthesis and mitosis in the granulosa cells.8 A change in shape and acquisition of mitotic potential in the granulosa cells are the hallmarks of recruitment. Such observations suggest that the mechanisms governing recruitment may involve a regulatory response at the level of the granulosa cell. Recruitment is pituitary independent, and it probably is controlled by autocrine/paracrine mechanisms. Whether it is effected by a stimulator or the loss of an inhibitor is uncertain; however, primordial follicles undergo rapid recruitment when removed from the ovary and cultured in vitro.11 These observations support the inhibitor idea. Fig. 7. Photomicrograph of nongrowing primordial and a newly recruited (growing) follicle in the human ovary. Notice the cuboidal granulosa cells ( arrowheads) in the newly recruited primordial follicle. Several different hypotheses have been put forth to explain the mechanism of recruitment. First, the process appears to occur in primordial follicles nearest the medulla where blood vessels are prominent. This supports the hypothesis that exposure to nutrients or blood-borne regulatory molecules could play a role in the control of recruitment. Second, an internal oocyte clock mechanism has been proposed to control recruitment.12 In this hypothesis, the clock is related to the time that the oocyte initiates meiosis in the embryo. It is noteworthy that recruitment can be modulated.8 In rodents, the rate of recruitment can be attenuated by removing the neonatal thymus gland, starvation, or treatment with exogenous opioid peptides. These are important observations, because they argue that ligand-receptor signaling pathways are likely to regulate recruitment. Understanding the regulatory mechanisms underlying recruitment remains a major task in reproductive biology. The early stages of folliculogenesis can be divided into three classes based on the number of layers of granulosa cells, the development of theca tissue, and the expression of a small cavity or antrum. The classes are the primary, secondary, and early tertiary follicles (Fig. 9). As the morphologic complexity increases, important cellular and physiologic changes occur in the follicle that render it competent to respond to gonadotropins. The following sections examine the structure and function changes that accompany preantral follicle growth and development. A primary follicle consists of one or more cuboidal granulosa cells that are arranged in a single layer surrounding the oocyte (Fig. 10). Simultaneous with the shape change and mitotic activities that accompany recruitment (Figs. 7 and 10), the cuboidal granulosa cells begin to express FSH receptors.13,14 The mechanism underlying this critical event in folliculogenesis remains uncertain, but there is evidence in rodents15 that granulosa-derived activin may play an important role in the expression of FSH receptor by autocrine/paracrine mechanisms (Fig. 11). Although the granulosa cells express FSH receptors at this very early stage in folliculogenesis, it is believed that the physiologic levels of plasma FSH during the normal menstrual cycle do not influence granulosa responses because primary follicles lack an independent vascular system. Nevertheless, because there are blood vessels in the vicinity (Fig. 10), FSH-induced changes in primary follicle function may occur in response to abnormally high levels of plasma FSH, such as those that occur during ovulation induction or aging. 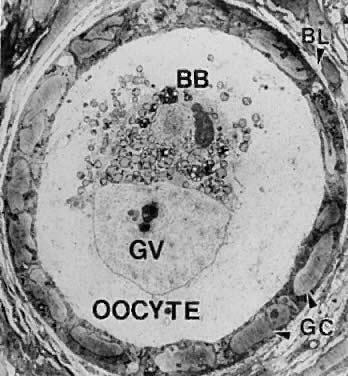 During primary follicle development, the granulosa cells send processes through the zona layer, where they form gap junctions with the oocyte cell membrane, or oolemma (Fig. 12). Gap junctions are intercellular channels composed of proteins called connexins.20,21 There are at least 13 members of the connexin family that directly couple adjacent cells to allow the diffusion of ions, metabolites, and other low-molecular-weight signaling molecules such as cAMP and calcium.20,21 Connexin 37 (C×37) is an oocyte-derived connexin that forms gap junctions between the oocyte and surrounding granulosa cells.22 Evidence from C×37-deficient mice assigns C×37 an obligatory role for folliculogenesis, ovulation, and fertility.22 Large gap junctions are also present between the granulosa cells themselves (Fig. 12). C×43 is a major gap junction protein expressed in the granulosa cells.23 As a consequence of gap junctions, the primary follicle becomes a metabolically and electrically coupled unit. This communication between the granulosa and oocyte remains throughout folliculogenesis and is responsible for the synchronous expression of important activities (positive and negative). A secondary follicle is a preantral follicle with 2 to 10 layers of cuboidal or low columnar cells that form a stratified epithelium (Fig. 13). As seen in Figure 10, the transition from a primary to a secondary follicle involves the acquisition of a second layer of granulosa cells. This transition is accomplished by the continuing division of the granulosa cells. The mechanisms regulating granulosa mitosis are poorly understood. However, exciting research in rodents has provided compelling evidence for the involvement of an oocytederived growth factor, called growth differentiation factor-9 (GDF-9). GDF-9 is a novel member of the transforming growth factor-β (TGF-β) superfamily.24 GDF-9 is strongly expressed in the ovary; it is localized only in oocytes of recruited follicles.25 In GDF-9 deficient mice, follicle growth and development stop at the primary stage; consequently no dominant follicles form, and the females are infertile.26 Accordingly, GDF-9 is obligatory for folliculogenesis after the primary stage, presumably because it is an obligatory mitogen for granulosa cells. A fundamental concept that emerges from this work is that the oocyte plays a pivotal role in regulating folliculogenesis through its ability to produce novel regulatory ligands (e.g. GDF-9), which are crucial for folliculogenesis. 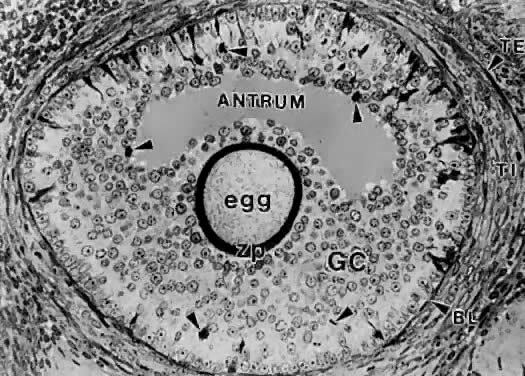 In the secondary follicle, the oocyte completes its growth. When the follicle is about 200 μm in diameter, the oocyte has attained its maximum size and grows no more, despite the fact that the human follicle enlarges to a diameter of 2 cm or more (Fig. 14). 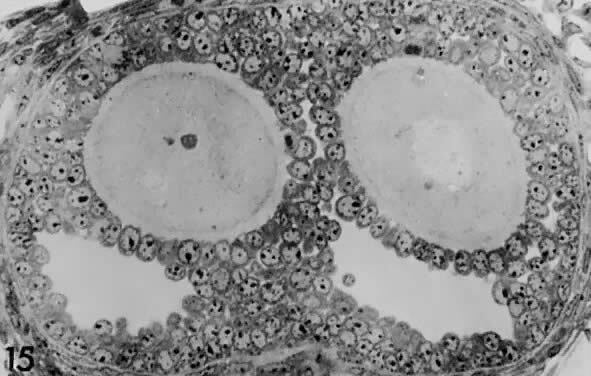 It is well documented in rodents that granulosa cells play an obligatory role in the growth and differentiation of the oocyte.28,29 An important differentiation event that occurs when the oocyte completes its growth is acquisition of the capacity to resume meiosis.30 Oocytes normally do not resume meiosis during folliculogenesis, and a mechanism must operate to inhibit this process (i.e. germinal vesicle breakdown [GVBD]) and the resumption of meiosis. The underlying mechanism for the inhibition remains unknown; however, there is evidence to support the concept that granulosa derived cAMP may play an important role in inhibiting the resumption of meiosis.30 In such a mechanism, FSH-induces cAMP in the granulosa cells, which diffuses into the oocyte through the C×37 gap junction, where it proceeds to inhibit GVBD (Fig. 15). Fig. 15. A diagram of the hypothetical mechanism for the cyclic AMP (cAMP) inhibition of germinal vesicle breakdown (GVBD) or resumption of meoisis. Follicle-stimulating hormone (FSH) receptor signal transduction in the granulosa cells leads to increased cAMP production. The cAMP can diffuse through the granulosa-oocyte connexin-37 (C×37) gap junctions, where it accumulates at high levels in the ooplasm to inhibit the breakdown (BD) of the germinal vesicle (GV) ( i.e. inhibits the resumption of meiosis or GVBD). When a preantral follicle completes the secondary stage in development, it contains five distinct structural units: a fully grown oocyte surrounded by a zona pellucida, six to nine layers of granulosa cells, a basal lamina, a theca interna, and a theca externa (Fig. 13). The first indication of the onset of tertiary follicle development is the appearance of a cavity in the granulosa cells.31 In response to an intrinsic stimulus, a cavity begins to form at one pole of the oocyte. This process, called cavitation or beginning antrum formation, is characterized by the accumulation of fluid between the granulosa cells that in time results in the formation of an internal cavity (Fig. 16). At completion of cavitation, the basic plan of the graafian follicle is established, and all the various cell types are in their proper position awaiting the stimuli that will shift them along paths of differentiation and proliferation (Fig. 16). Based on evidence from polyoocyte follicles, the specification mechanism of cavitation probably is tightly regulated (Fig. 17). What controls cavitation or early antrum formation? It is well known that cavitation occurs in hypophysectomized animals, demonstrating that pituitary hormones such as FSH are not required for this morphogenetic event.32 Consistent with this concept is the observation that cavitation occurs in FSH-β-deficient mice.33,34 It seems reasonable to conclude that cavitation is controlled by autocrine/paracrine mechanisms. Two growth factors expressed in the follicle itself have been implicated in cavitation: activin and KIT ligand. Treating cultured granulosa cells with activin causes morphogenetic changes that result in the formation of a histologic unit with an antrum-like cavity.35 Blocking the action of the KIT ligand in the ovary prevents the formation of antral follicles; consequently, there are no ovulations, and the female is infertile.36 In this regard, evidence supports the concept that the oocyte gap junctions are also important for cavitation. Gap junctions are intercellular channels composed of proteins called connexins.20,21 There are at least 13 members of the connexin family that directly couple adjacent cells, allowing diffusion of ions, metabolites, and other low-molecular-weight signaling molecules such as cAMP.20,21 C×37 appears to be an oocyte-derived connexin that forms gap junctions between the oocyte and surrounding granulosa cells. Evidence from C×37-deficient mice assigns to C×37 an obligatory role in graafian follicle formation, ovulation, and fertility.22 Collectively, all this evidence suggests that follicle-derived activin, KIT, and C×37 are involved in the autocrine/paracrine mechanisms that control cavitation. A graafian follicle can be defined structurally as a heterogeneous family of relatively large follicles (0.4 to 23 mm) characterized by a cavity or antrum containing a fluid called follicular fluid or liquor folliculi. The characteristic structural unit of all graafian follicle is the antrum. For this reason, the term antral follicle is used correctly as a synonym for graafian follicle. The follicular fluid is the medium in which the granulosa cells and oocyte are found and through which regulatory molecules must pass on their way to and from this microenvironment.37 Surprisingly, we know almost nothing about the physiologic significance of the antrum and follicular fluid in folliculogenesis. It is clear that follicle development and ovulation occur in birds and amphibians despite the absence of an antrum and follicular fluid. Nonetheless, its presence in all mammalian species testifies to its physiologic importance. A graafian follicle is a three-dimensional structure with a central antrum surrounded by a variety of different cell types (Fig. 18). 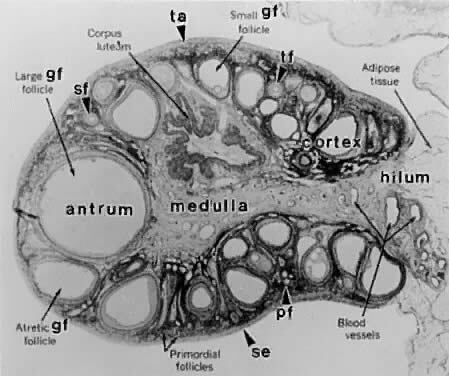 There are six distinct histologic components in the graafian follicle, including the theca externa, theca interna, basal lamina, granulosa cells, oocyte, and follicular fluid (Fig. 18). A graafian follicle does not change its morphologic complexity as growth proceeds. All graafian follicles have this same basic architecture; even though there are dramatic changes in graafian follicle size, their appearance remains more or less the same. The theca externa (Fig. 19) is characterized by the presence of smooth muscle cells,38,39 which are innervated by autonomic nerves.27 Although the physiologic significance of the theca externa remains unclear, there is evidence that it contracts during ovulation and atresia.40,41 Changes in the contractile activity of the theca externa may be involved in atresia and ovulation; however, this has not been rigorously proved. The corpus luteum retains a theca externa throughout its life,42 but the significance during luteinization and luteolysis is not known. The theca interna is composed of differentiated TICs located within a matrix of loose connective tissue and blood vessels (Fig. 19). In all graafian follicle, LH is a key regulatory hormone for TIC function, and its importance in regulating TIC androgen production in vivo and in vitro has been established.27 Beginning at the very early stages of graafian follicle development, the TICs express their differentiated state as androgen (i.e. 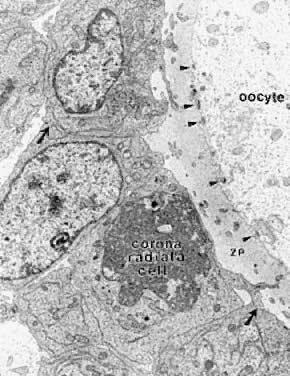 androstenedione-producing cells).27 The theca interna is richly vascularized and serves to deliver hormones (e.g. FSH, LH), nutrient molecules, vitamins, and cofactors required for the growth and differentiation of the oocyte and granulosa cells. We know little about the regulatory elements that control the theca vasculature. A functional link between the vasculature and graafian follicle development is suggested by the evidence43 that all monkey graafian follicles express high levels of FSH and LH receptor regardless of size, but when 125I-human chorionic gonadotropin (hCG) is injected systemically, only the dominant graafian follicle appears capable of accumulating 125I-hCG in the theca interna. These results suggest that the dominant graafian follicle expresses increased vascularization, which plays an important role in its selected maturation. In this regard, follicle-derived vascular endothelial growth factor44,45 and other angiogenic factors such as endothelin46 are being intensively investigated. The theca compartments (i.e. theca externa and interna) express their differentiated functions at the beginning of graafian follicle development (at cavitation) and appear to constitutively express a mature phenotype throughout the life and death of the graafian follicle. In a broad sense, there is little or no evidence that major changes occur in the theca layers during the various stages of graafian follicle development beyond those related to vascular and proliferative activities. This could imply that it is the granulosa cells (and perhaps the oocyte) that are variable and therefore responsible for graafian follicle diversity. In the graafian follicle, the granulosa cells and oocyte exist as a mass of precisely shaped and precisely positioned cells (Fig. 18). 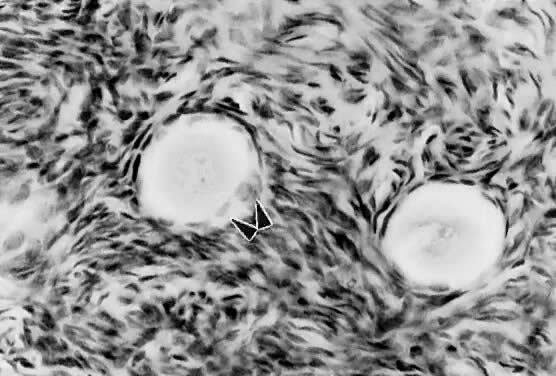 The spatial variation creates at least four different granulosa cell layers or domains: the outermost domain is the membrana granulosa, the inner most domain is the periantral, the intermediate domain is the cumulus oophorus, and the domain juxtaposed to the oocyte is the corona radiata (Fig. 20). A characteristic histologic property of the membrana domain is that it is composed of a pseudostratified epithelium of tall columnar granulosa cells, all of which are anchored to the basal lamina. The differentiation of a granulosa cell can be traced to its position within the cellular mass (Fig. 20). For example, cells in the membrana domain stop proliferating before those in central domain.47,48 The ability of the granulosa cells in the inner domains to continue dividing throughout graafian follicle development suggests they may be precursor cells. The cessation of mitosis in the membrana domain is characterized by the progressive expression of overt differentiation in which they assume the functional phenotype of fully differentiated cells. This process requires the temporal and coordinate expression of genes that form the basis of granulosa cytodifferentiation. The mechanisms by which this occurs involves ligand-dependent signaling pathways that are coupled to the activation and inhibition of specific genes. For example, normal differentiation of the membrana granulosa cells requires the activation of specific genes, including those for cytochrome P450 aromatase (P450arom)49 and the LH receptor,50 and the inhibition of structural genes in the apoptotic pathway. In contrast, the granulosa cells in the periantral, cumulus, and corona radiata domains proliferate, but they fail to express the genes that are involved in a terminal differentiation (Fig. 20). What controls granulosa heterogeneity? All the granulosa cells in the healthy graafian follicle express FSH receptor,13,51,52 and it has been shown that murine granulosa cells in the membrana and cumulus domains produce cAMP in response to FSH stimulation.53 These observations argue that post cAMP regulatory events are involved in the aspects of granulosa heterogeneity. The idea that the oocyte plays a key role in causing the different patterns of granulosa cytodifferentiation during graafian follicle development is supported by studies in rodents.54 A dialogue takes place between the oocyte and granulosa cells that has a great impact on folliculogenesis. In developing murine graafian follicles, the differential pattern of proliferation and differentiation between the granulosa in the membrana and cumulus domains are under the control of secreted oocyte morphogens.54 A novel TGF-β family member, GDF-9, was discovered in the mouse.24,25 Definitive evidence that GDF-9 is obligatory for folliculogenesis came from studies of GDF-9-deficient mice.26 In these animals, the absence of GDF-9 resulted in the arrest of follicle growth and development at primary stage and the females are infertile. These data support the idea that GDF-9 secreted by the egg is obligatory for graafian follicle development, granulosa cytodifferentiation and proliferation, and female fertility. The clinical relevance of this new concept is demonstrated by the presence of GDF-9 mRNA in the human ovary.25 The current challenges are to elucidate the mechanisms controlling GDF-9 expression and to identify the target cells for GDF-9 and the biologic processes that GDF-9 regulates. The concept that oocyte-derived growth factors control folliculogenesis and fertility could have important implications for human physiology and pathophysiology. All graafian follicles can be divided broadly into two groups: healthy and atretic (Fig. 21). The main difference between these two groups is whether apoptosis is occurring in the granulosa cells. The development of a graafian follicle (healthy or atretic) follows a progressive course over time. This implies that variability or heterogeneity is a normal consequence of folliculogenesis. A healthy graafian follicle becomes progressively more differentiated with increasing time until it attains the preovulatory stage (Fig. 22). The time for this process (Fig. 2) is about 2 months in women.3 As this occurs, there is a temporal and spatial pattern of expression of large numbers of genes. In healthy follicles, these genes direct cytodifferentiation, proliferation, and follicular fluid formation. In atretic follicles, the time-dependent changes in gene expression cause the cessation of mitosis and the expression of apoptosis (i.e. follicle atresia). During atresia, the oocyte and granulosa cells become committed to express genes that lead to apoptosis.55 In healthy and atretic graafian follicles, the control mechanisms involve ligand-dependent signaling pathways that inhibit or stimulate the expression of differentiation and apoptosis (Fig. 22). Understanding the molecular mechanisms and cellular consequences of the ligand-receptor signaling pathways that control graafian follicle fate is a major goal of reproductive research. The process of graafian follicle growth and development can be arbitrarily divided into several stages based on follicle size (Figs. 2 and 22). It is convenient and important for clinicians and researchers to identify the physiologic function of various types or classes of follicles over the cycle. The healthy human graafian follicle has a destiny to complete the transition from the small (1 to 6 mm), medium (7 to 11 mm), and large (12 to 17 mm) to the fully differentiated preovulatory state (18 to 23 mm). 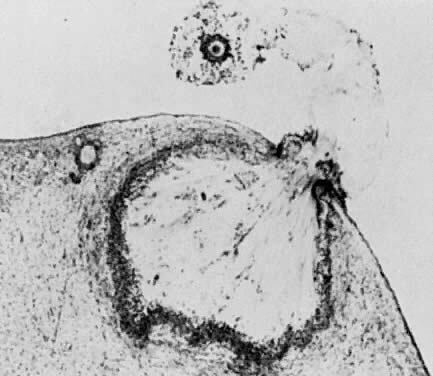 The atretic graafian follicle has a destiny to complete the transition from the small to the medium stage (1 to 10 mm) but appears incapable of growing to the large size under normal physiologic conditions.56 Because the process of graafian follicle development is asynchronous, it produces a large, heterogeneous population of graafian follicles in the ovaries at any moment in time (Fig. 3). Each of these morphologically distinct graafian follicles is a dynamic structure undergoing a flow or progression of developmental change on its way to becoming more differentiated or more atretic (Fig. 22). It should be kept in mind that this results in the presence of an extremely heterogeneous pool of graafian follicles. It is the heterogeneity that makes it difficult to come to grips with a simple functional definition for the graafian follicle. The size of a graafian follicle is determined largely by the size of the antrum, which is determined by the volume of follicular fluid, which is determined by the bioavailability of FSH in the fluid.57 FSH is obligatory for graafian follicle development, and no other ligand by itself has the ability to induce follicular fluid formation. In the absence of FSH, follicular fluid is not produced, and no graafian follicles develop. The proliferation of the follicle cells also contributes to graafian follicle growth; in healthy follicles, the granulosa and theca cells proliferate extensively (as much as 100-fold), concomitant with the antrum becoming filled with follicular fluid (Fig. 23). These events (i.e. increased follicular fluid accumulation and cell proliferation) are responsible for the tremendous growth of healthy graafian follicles.3,58 In contrast, it is the cessation of mitosis and follicular fluid formation that determines the size of the atretic graafian follicle. Selection of the Dominant Follicle. In each menstrual cycle, the ovaries normally produce a single dominant follicle that participates in a single ovulation. Morphometric analysis of normal human ovaries (Figs. 2 and 3) indicates that the dominant follicle that will ovulate in the subsequent cycle is selected from a cohort of healthy, class 5 follicles measuring 4.7 ± 0.7 mm in diameter at the end of the luteal phase of the menstrual cycle.1,2,3,59 At the time of selection, each cohort follicle contains a fully grown oocyte, about 1 million granulosa cells, a theca interna containing several layers of TICs, and theca externa composed of smooth muscle cells (Figs. 3 and 23). There is compelling evidence from laboratory animal61 and primate experiments,62 that a secondary rise in plasma FSH must be attained for a follicle to achieve dominance. As shown in Figure 24, the secondary FSH rise in women begins a few days before the progesterone levels fall to basal levels at the end of luteal phase, and the FSH levels remain elevated during the first week of the follicular phase of the cycle.63 Experiments using monkeys have demonstrated that the dominant follicle undergoes atresia if the secondary rise in FSH is prevented by treatment with exogenous estradiol.64 An important concept in reproductive biology is that an increase in bioactive FSH is obligatory for follicle selection and fertility.33,65 It appears that decreased estradiol production by the corpus luteum is the principal cause for the secondary rise in FSH66 rather than the fall in corpus luteum-derived inhibin A (Fig. 24). How does the secondary rise in FSH control selection? The results from studies of human follicular fluid support the conclusion that the rise in plasma FSH leads to a progressive accumulation of relatively high concentrations of FSH in the microenvironment of one follicle in the cohort; this follicle is destined to become dominant (Fig. 25). In developing healthy (dominant) follicles (class 5 to 8 follicles), the mean concentration of follicular fluid FSH increases from about 1.3 mIU/ml (about 58 ng/ml) to about 3.2 mIU/ml (about 143 ng/ml) through the follicular phase.4,67 In contrast,4,67 the levels of FSH are low or undetectable in the microenvironment of the nondominant cohort follicles (Fig. 25). The entry of FSH into follicular fluid at cavitation is believed to provide the induction stimulus that initiates the process of graafian follicle growth and development. At the cellular level, it is the FSH receptor on the granulosa cell that is the fundamental player in this process. 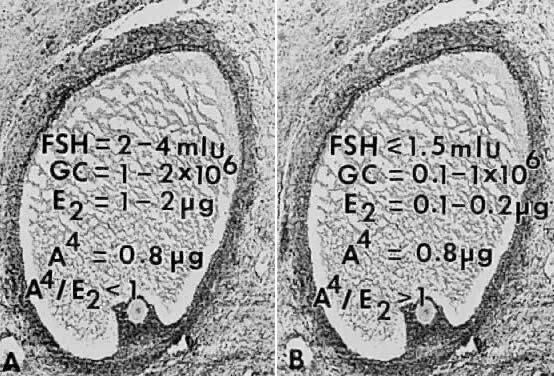 When an appropriate high FSH threshold is reached in one graafian follicle, it is selected to become dominant.31 In contrast, the small graafian follicles in the cohort with subthreshold levels of FSH become nondominant (Figs. 22 and 25). The mechanism whereby one small graafian follicle in a cohort is able to concentrate high levels of FSH in its microenvironment remains one of the mysteries in ovary physiology. An important point is that estradiol produced by the dominant follicle inhibits the secondary rise in FSH by a negative feedback mechanism (Figs. 24 and 26). This is believed to ensure a subthreshold level of FSH in the nondominant cohort follicles, which then leads to atresia. Mitosis in granulosa cells of atretic cohort follicles can be stimulated by treatment with human menopausal gonadotropin (hMG) during the early follicular phase.59 If FSH levels are increased to threshold levels within the microenvironment, then nondominant follicles may be rescued from atresia. This phenomenon could have implications for the way in which exogenous FSH or hMG triggers the formation of multiple dominant follicles in women undergoing ovulation induction. Fig. 26. Diagram illustrating the important consequences of the increased levels of follicle-stimulating hormone(FSH) in the early follicular phase of the human menstrual cycle on the growth and development of the dominant follicle. There is no doubt that the ability of the ovary to produce a dominant follicle, which ovulates a fertilizable egg, is under the control of the endocrine system, most notably by the hormones FSH and LH. Anything that interferes directly or indirectly with the normal action of the gonadotropins can be expected to produce a condition leading to apoptosis and infertility. Research in the past decade has established the concept that FSH and LH signal transduction can be modulated by proteins with growth factor activity. All growth factors are ligands that act locally to amplify or attenuate cellular responses. The autocrine concept is that ligands (e.g. hormones, growth factors, neurotrophins, cytokines) produced by a cell act on the cell itself to modulate cellular activities (e.g. growth, differentiation, apoptosis) (Fig. 39). The paracrine concept is that ligands produced by one cell act on adjacent cells to modify or modulate cell functions (Fig. 39). All five major families of growth factors are expressed within developing follicles of rats and humans.133 The principle emerging from an enormous amount of in vivo and in vitro research is that intrinsic growth factors interact with the endocrine system to evoke the physiologic control of all aspects of folliculogenesis, including recruitment, preantral follicle growth, selection, atresia, and ovulation. Two growth factors, oocyte-derived GDF-926 and granulosa-derived IGF-I,134 are obligatory for folliculogenesis and fertility in female mice. The probability that new ovarian growth factor systems will be discovered in the future is high. Definitive evidence that local growth factors are obligatory for folliculogenesis and fertility in women is lacking, and the physiologic significance of the autocrine/paracrine concept in human ovaries remains to be established. The current challenges are to understand how specific autocrine/paracrine regulatory molecules control folliculogenesis and how these controls are integrated into the overall physiologic and pathophysiologic mechanisms. I thank Ms. Andi Hartgrove for typing the manuscript.